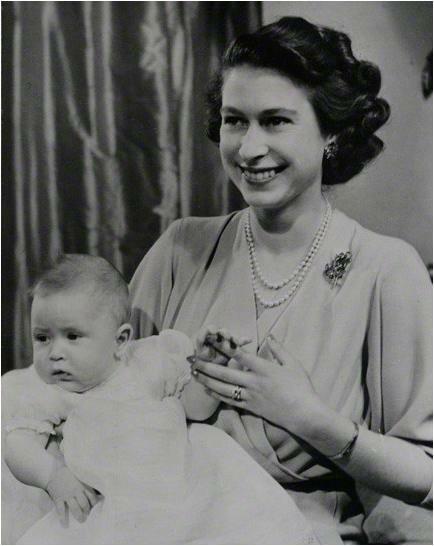 This brooch was a birthday gift to then-Princess Elizabeth from her parents, King George VI and Queen Elizabeth, in 1945. 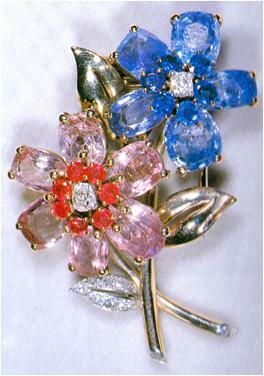 Made by Cartier, it's a rather adorable spray of two flowers: one pink, made of pink sapphires with a row of rubies surrounding the diamond in the center, and one blue, made of blue sapphires and a diamond center. The stems and leaves are gold, with one leaf of pavé-set diamonds. According to Leslie Field's The Queen's Jewels, the gift also included a matching pair of earrings "in the shape of miniature flowers on tiny stems", which are likely the ones seen above. The earrings, to my knowledge, haven't been seen in many years. The brooch, however, is still in use, though its outings are rather rare. In current news...on Sunday, the Queen was pictured with the Duke of Edinburgh (for the first time in quite a while!) heading to church at Balmoral. She was wearing the Frosted Sunflower Brooch. For church the previous weekend, she opted for the Round Cambridge Emerald Brooch without the pendant (thanks Jelena for the heads up).